JNN 10 July 2014 KUWAIT CITY — A prominent opposition leader in Kuwait was released on bail Monday after daily protests calling for him to be set free. Lawyer Thamer al-Jedaei told The Associated Press that Musallam al-Barrack still faces charges of insulting the judiciary and accusing top judges of bribery. He said al-Barrack’s hearing was set for September. The former opposition lawmaker was arrested last Wednesday after revealing documents alleging huge sums of illicit financial transfers were made to senior officials, including naming specific judges in the Arab monarchy. 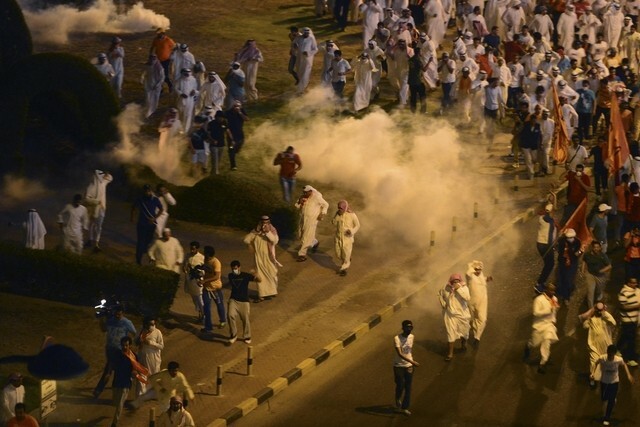 In the days following al-Barrack’s arrest, protesters took to the streets in his hometown province of Jahra in the neighborhood of Sabah Al-Nasser, southeast of the capital Kuwait City. Protesters there burnt tires and some fired flares at security officers. Al-Barrack’s release comes less than 24 hours after more than 2,000 supporters defied government orders and protested in the capital after traditional evening Ramadan prayers. Police broke up the demonstration by firing tear gas and stun grenades at the crowd as they marched into a historic and busy market. Activists said a number of protesters were arrested and wounded. Kuwait’s political tension has deepened rifts in one of Washington’s most important Gulf allies. Kuwait’s prime minister, Jaber Al Mubarak Al Sabah, a member of the ruling family, has dismissed al-Barrack’s documents, saying they have no value and do not stand up to scrutiny. Al-Barrack’s lawyer said people would continue to press for other demands, despite his client’s release. “His release is irrelevant to the protests. The protests are against corruption, not to free Musallam Al-Barrack,” al-Jedaei said. Many protesters Sunday were members of his tribe, and last week the protesters chanted directly for al-Barrack’s release. Others joined the protest to call for greater government accountability and transparency, and an end to corruption. This entry was posted in Middle East and tagged Corrupt Judiciary, Corruption, Kuwait Opposition Leader, Lawyer Thamer, Musallam al-Barrack, Protesters. Bookmark the permalink.